Web Of Trust - Website Trust Ratings from Other Internet Users - Ask Leo! 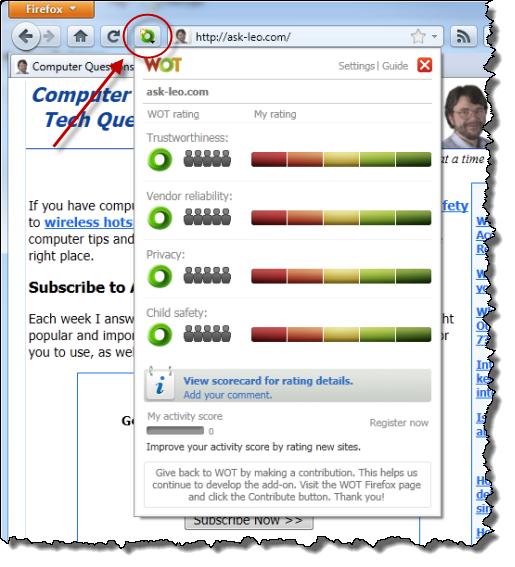 Web of Trust is a "crowdsourced" collection of website ratings that can help you decide if a site is trustworthy or not. “How do I know if a website is safe?” is a question that I get pretty regularly. In general, it’s difficult for the average person to ascertain without help. 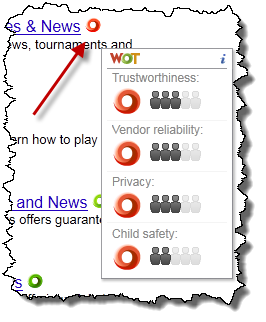 Web of Trust, or simply WOT, at mywot.com, is one very valuable form of help. 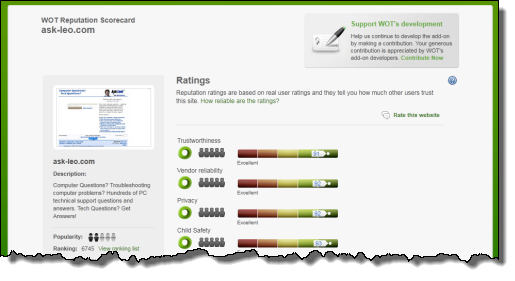 WOT collects user ratings from internet users just like you and me and makes those ratings available in various forms. When you’re thinking of clicking on a link, you can use these to look before you leap. WOT relies on a “crowdsourced” model of information gathering. What that means is that registered WOT members rate websites that they actually visit and interact with based on four criteria: trustworthiness, vendor reliability, privacy, and child safety. Much like a rating system that you might find in an online store or other votable venue, sites accumulate a reputation based on how people vote. Those ratings are then made available to anyone. Can the system be gamed? By far, the most commonly asked question that people have is “Doesn’t that mean that the system can be gamed?” For example, could a malicious site purposely get a bunch of people to rate it as safe? Or conversely, could a competitor of a legitimate site maliciously give that site poor ratings? It’s certainly been my primary concern; in fact, it kept me from recommending WOT for some time. When learning about the concept behind WOT, some people conclude that the system could easily be spammed with tons of ratings. They assume that unscrupulous competitors can rate their site down or otherwise manipulate reputations, but that’s not true. We designed the reputation system to be as fair as possible and very resistant to manipulation, including more sophisticated attacks conducted using botnets, for example. rating behavior from several aspects in order to determine their reliability. When you start using WOT, your ratings have little weight, but if you keep rating sites consistently, your ratings will be considered more reliable over time. The meritocratic nature of the system makes it far more difficult for spammers to abuse, because bots will have a hard time simulating human behavior over a long period of time. Put more directly: WOT has a trust system of its own and the ratings that have the most impact are those from trusted sources. Thankfully, Ask Leo! scores “Excellent” in all four measures: trustworthiness, vendor reliability, privacy and child safety. It’s important to note that no site will be perfect. As much as I hate to see it, occasionally people are unhappy with the service that I provide and might rate Ask Leo! lower. The same is very true for any site. That’s why the concept of crowdsourcing is so valuable. Rather than being swayed by a proportionally small number of bad experiences, site reputations are based on the majority of experiences – of trusted reviewers at that – and represent an evaluation of what you are likely to experience yourself. Once again, WOT uses crowdsourcing to rate the comments. People can “agree” or “disagree” with a comment, which gives you a feel for just how common that sentiment might be and to what degree you might want to pay attention to it in forming your own opinion. Yes, even Ask Leo! has at least one negative comment. And several votes disagreeing with it. Remembering to check a URL with WOT before you go there is … well, it’s a hassle at best and it’s something that you’re not likely to remember to do at worst. Not a problem. WOT has browser add-ons that make it even easier. The WOT browser add-on is available for IE, FireFox, Chrome, Opera, and Safari. A couple of interesting things happen when the add-on is installed. Not only is the icon red, but you can see the various ratings by category. This is clearly not a site that’s safe for children, for example. The icon changes color with the reputation of the site. In this case, I’ve clicked on it to display the entire reputation panel. From there, you can then also visit the WOT scorecard page for the site, if you are so inclined. This is the same panel that registered WOT users would use to actually rate a site that they’re visiting. You may start seeing WOT in more places, particularly if you’re on Facebook. WOT recently announced a partnership with Facebook to use WOT reputation ratings to protect users and warn them if the links that are being shared have a bad reputation. With a browser add-on installed, you’ll already see WOT’s reputation icons in Facebook as you do on search results. This new partnership goes a step further, warning people who share or click a questionable link. There’s a lot more to WOT, including the ability to determine which ratings are important to you, what search engines and sites its rating should appear in, and even under what rating conditions it should block access to sites. While it’s probably not a good idea to take the ratings as absolute gospel, WOT is a valuable source of information that can help you make significantly more informed decisions about the sites you visit. Web of Trust – I recommend it. Can I trust this site or utility? - There are a number of steps you can take to help determine if an unfamiliar utility is safe. How Can I Tell If a Website is Safe? - We're often enticed or directed to websites we've never been to before. We'll look at a couple of tools to help identify safe websites. How Much Can I Trust Information on the Internet? - Information on the internet ranges from truth to fiction to intentional misinformation. It's important to develop a critical eye towards everything you read. « Previous post: How do I keep my email address when I switch ISPs? WOT is an improvement over the others. I was always frustrated with McAffe Site Advisor because it rated sites “dangerous” that I’ve used safely for 3-4 years w/o a single problem. It seems that the same people were copying and pasting negative results from other rating sites, and rarely was a reason given. WOT provides the extra info that helps in evaluating the risk. Example: MyWay.com- I’ve used this for 4 yrs, no problems. The WOT rating indicated malware. WOT the…? Well, the fact that the ads at the bottom are the “cursormania” and “smileycentral” . So the site itself is OK, but the ads are NotOK. This additional info is an important consideration (for me) that other rating sites don’t offer. This is why WOT is, in my opinion, head & shoulders above the others. I am a very happy Web of Trust user and proud silver member. The browser add-on works great with Chrome as well as Firefox. Also, it might be worth mentioning that in addition to Facebook, the new WOT ratings work on Twitter too. * WOT frees me from the fear of shortened URL’s! Second matter, as a courtesy to you: I follow WOT on Twitter. I just now noticed that they did not post the URL to your fine article correctly. The URL was invalid. This is a bitly shortened version of the actual message by the @Web_of_Trust account on 24 May 2011 http://bit.ly/jCHqcd and this was the URL given http://t.co/DMhvQo4Recommended with extra text appended. Obviously those that re-tweeted did not click on the link and read your article first! They missed out! *I like your comment policy. Very sensible! I even read your article a second time through to make sure I didn’t overlook any mention of WOT for non-Facebook URL shortening services or Twitter platform! I would encourage you to rate your own scorecard and leave a comment, it is only bad form, if you do not identify yourself as the site owner. By identifying yourself as the site owner, people will know you will be bias towards your own site, so they will take your comment with a pinch of salt, but it also shows to people that you are prepared to work with the community to keep a green rating, and that you care for your green rating. I think it helps build trustworthiness to other raters by identifying myself to other raters, and putting a face to my site, so people who have problems with my site may contact me with their concerns, so I have a chance to improve the site for visitors, and answer their concerns. Good advice. I’ll probably do what you suggest when I have a few moments. Thanks! I am sorry to say that WOT is absolutely, positively untrustworthy. True, sometimes it does warn of a site that is unsafe, but the number of false warnings is shockingly high. I have had way too many times that a site I KNOW is safe was listed as unsafe. This is particularly a problem on sites with political opinions. Please, people, a site does not have a privacy issue or a safety issue for children just because you don’t agree with the content! My children’s college site was listed as unsafe! Yeah, right. I trust them with my kid, but woe betide if I read the college catalog online! Another issue is that sites inherit ratings. For instance, my sister-in-law’s blog is listed as unsafe because it is hosted by a blogging site that host blogs that too many people don’t like. They rate something other than what I am reading. The upshot of all this is that when I do go to a site and get a warning that pops up in front of the page, unless I can see around the popup that the site does, indeed, look dodgy, I have absolutely no way to know if the rating is trustworthy. I guess I could avoid every site that it flags, but YOU get to tell my sister-in-law that I can’t read her blog, m’kay? Trust? Yeah, right… just wait until one of them does not like your website and ask his group/team to join in to rate your harmless site down the RED lane. Then try to reason with them and you’ll see what you get. Lot’s of “Luck” if you would ask a Chinese… but only because in China, the color “red” means “luck”… everywhere else it means “warning”! Ever wondered why their own scorecard never shows anything but +/- 95 rating with all the “haters” out there? Great manipulation, making WOT a fake not to trust! I’ve been noticing red ratings on sites which make honest but derogatory comments about some corporations, like Monsanto. I’ve started wondering if WOT is being used in an attempt to shape public opinion. I wish there was some way to research that. As an active user of WOT, I’ve noticed that there are many false positives, for example political or religious sites which are negatively rated, often citing hate speech or something like that. This is because many WOT users who are of another opinion, use WOT to undermine these sites. I’ve never heard of corporations doing that but it’s entirely possible that they may have outsourced this work in some way.